Intense garnet in color, this Barolo has an equally pronounced nose with fruity, mineral and spicy aromas. Particularly noteworthy are the elegant notes of red fruit, prunes, black cherries, and rasberries. The mineral quality continues on the palate, where intense and enveloping tannins are well balanced with a fresh acidity. The strong finish on this wine makes it a good companion to flavorful meat dishes, particularly braised red meat, stews, game, and roasts, as well as "fonduta" and truffles. Rich and ripe for the vintage, with lots of plum, nectarine and rose bush aromas. Full-bodied, with a solid core of ripe fruit and velvety tannins. Long and fruity. This is the third vintage of this single-vineyard wine and it's getting better and better. Best after 2012. 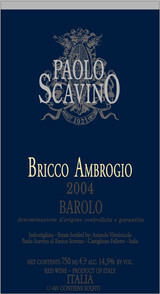 The 2004 Barolo Bricco Ambrogio is the most forward of these 2004 Barolos. Made in a fruit-driven style, this plump, juicy wine is packed with sweet dark fruit. White pepper, truffles, plums and prunes develop with air, but this wine is ultimately more about immediacy than complexity. Still, it offers much pleasure. Anticipated maturity: 2009-2019.